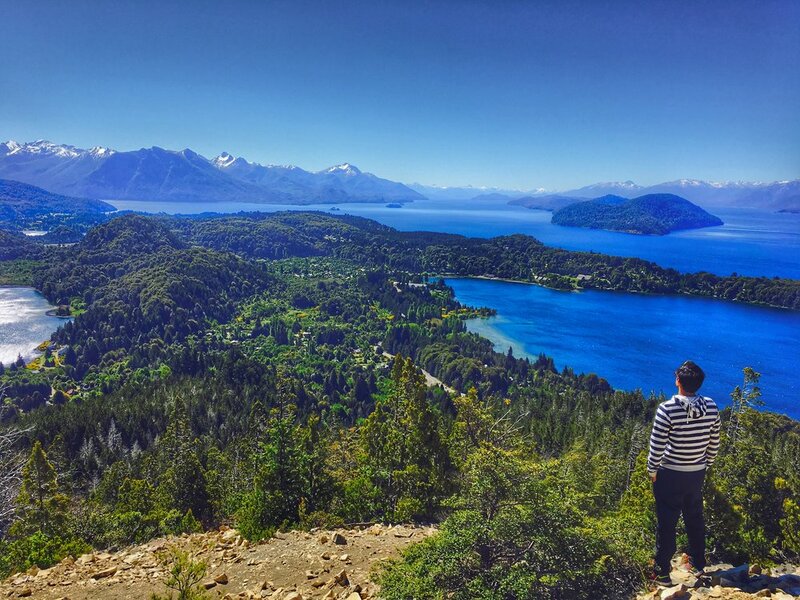 Nestled along the foothills of the Andes Mountains, Bariloche serves as a perfect side trip for those who have 3-4 days to spend after visiting or working in Buenos Aires. Along the northern reaches of Patagonia and positioned along the shores of Nahuel Huapi Lake, Bariloche is a picturesque natural wonder with snow-capped mountains and glacial lakes perfect for easy-to-hard trekking/hiking or kayaking in the warmer months and skiing in the colder months. Given a well-developed tourist infrastructure, multitude of outdoor activities, great restaurants, and artisanal chocolateering, Bariloche is also perfect for a multi-generational jaunt in Argentina as it is easier on kids or grandparents than the more rugged parts of Patagonia (Torres del Paine, El Chalten, etc.). Given a history of immigrants from Germany, Austrian, Italy, and Switzerland from the late 19th century onwards, Bariloche often feels like a Bavarian architectural town with an Argentine twist. 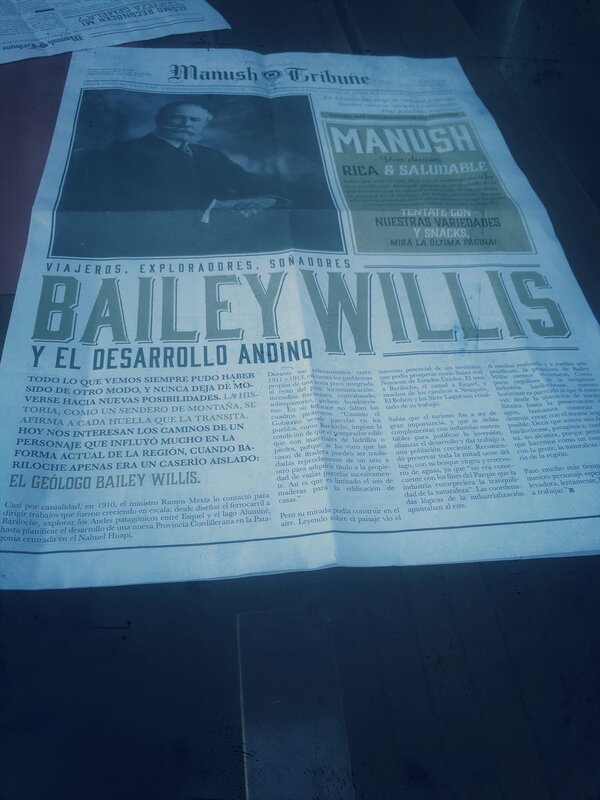 Bariloche also has a strange dichotomy of history. Its natural beauty (specifically Bosque de Arranyes) is thought to have have served as a muse for Disney's production of Bambi. However, in its darker shadows of history, Bariloche served as a haven for escaping Nazi war criminals upon the fall of the Third Reich at the conclusion of World War II. As it still reckons with its past, Bariloche has also simultaneously begun to welcome the world. It is not only a popular destination for nature-loving portenos from Buenos Aires, but very popular among Brazilians, Europeans, Israelis, and increasingly Americans. Bariloche is situated in the middle of the famed Ruta 40 (the Argentine retort to America's Route 66) which traverses the entire Andean backbone of Western Argentina with the wine country of Mendoza to the north on Ruta 40 and the heart of Patagonia to the south on Ruta 40. For those who have even more time, this may be a road trip worth exploring while stopping on Bariloche along your journey. If your travels take you to Bariloche for a few days, we hope our recommendations help make planning your trip easier! At the time of this writing, Uber does NOT operate in Bariloche. We had a phone that worked internationally so we found it most convenient to call the concierge at our hotel who gladly called a taxi to pick us up from either the hotel or from whichever location we were visiting back to the hotel. Remember that as a Southern Hemisphere destination, the seasons are opposite from the US. 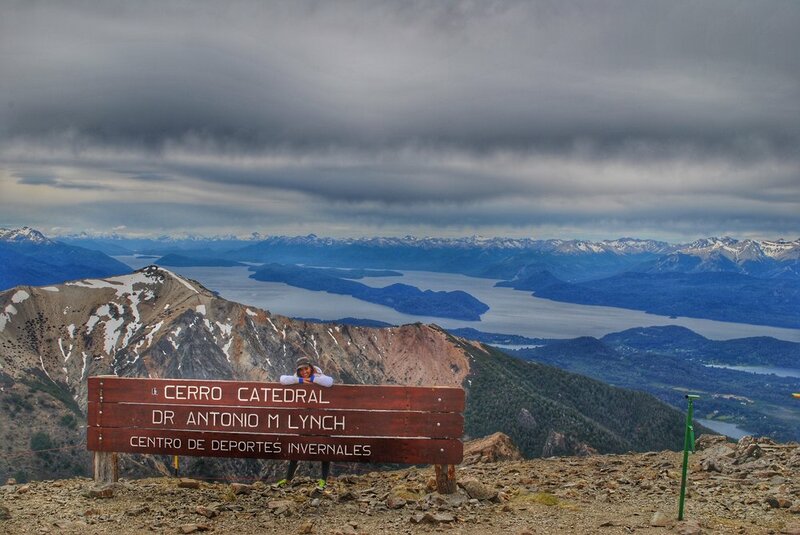 That being said Bariloche is a year-round destination depending on your interests. It is a very popular ski destination during its winter. Our trip was in November during its spring so we focused more on easy-to-medium hikes, eating, and soaking in the serene views. This is where we stayed for our 4 nights. 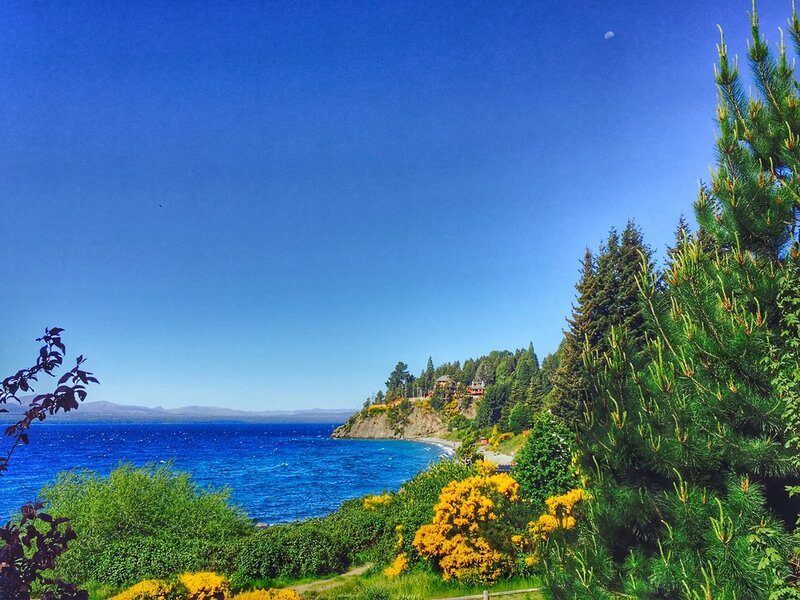 The hotel has some spectacular views as it sits upon the bluffs overlooking Lake Nahuel Huapi, access directly to the beach (playa) as well as its own heated pool! It truly is a luxury lodge with big rooms and bathrooms. The staff is wonderful and extremely helpful. In fact, Roberto at the front desk helped us with some tips regarding hikes. Every member of the front desk staff helped us with questions, called restaurants for reservations, and called us cabs whenever needed. They also provide free wifi and free breakfast with hot items which further adds to its value and allows you to power up before daily excursions/hiking! The location of the hotel is also great as it is near some great restaurants - Butterfly (very short walk), Las Morillas (very short walk), and La Salamandra Pulperia (walk or very short cab ride). The hotel location makes it easy to get into the city to try other restaurants/chocolate/bars or head out to the various hiking excursions/viewpoints such as Cerro Catedral, Cerro Campanario, Cerro Otto, or all the way out the Llao Llao Peninsula. This was the one other hotel we strongly considered. This is an uber luxury hotel that has been listed by Conde Nast as one of the best hotels in Argentina and has hosted the Clintons. It is the ultimate resort with gorgeous views, golf courses, and spa treatments. During our time in Bariloche, it was actually completely rented out for an antique car convention so the decision was out of our hands. We did stop by for some coffee and snacks after our Cerro Llao Llao and Villa Tacul hike. The one negative of this hotel would be that it is very far from the city center and some of the better dining recommendations. Use Cables Carril and Lynch to get to the top (green arrows). This map is based off of the official downloadable map: https://www.catedralaltapatagonia.com/mapa_pistas.php. We hope to encourage tourism to Cerro Catedral given its beauty and splendor. Ruta de los Siete Lagos (Route of the Seven Lakes) - we did not have a rental car so missed out on doing this. We also thought it was better to do with a rental car then through an organized tour. Multiple beautiful lakes and viewpoints and small towns to enjoy on this mini road-trip. Cerro Tronador - 36km hike and overnight camping required. We opted out as we weren't quite ready to give up our hotel bed.